The T-84 is a Ukrainian main battle tank, a development of the Soviet T-80 main battle tank. It was first built in 1994 and entered service in the Ukrainian Armed Forces in 1999. The T-84 is based on the diesel-engined T-80 version, the T-80UD. Its high-performance engine makes it one of the fastest MBTs in the world, with a power-to-weight ratio of about 26 horsepower per tonne (19 kW/t). The T-84 Oplot is an advanced version incorporating an armoured ammunition compartment in a new turret bustle; ten of these entered Ukrainian service in 2001. The T-84-120 Yatagan is a prototype model intended for export, mounting a 120 mm gun capable of firing standard NATO ammunition and guided missiles. 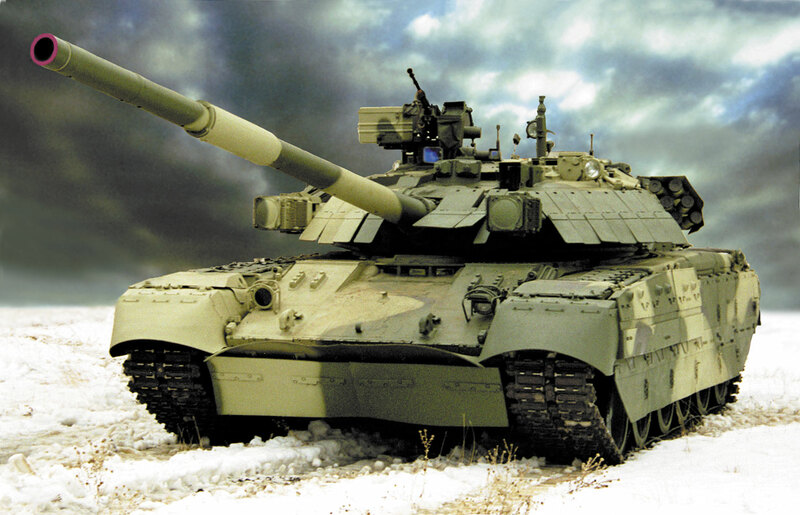 The T-84 is the latest Ukrainian development of the T-80 series, designed by KMDB in Kharkiv. A main design objective was to make Ukraine's arms industry independent of Russia's, after resulting difficulties in fulfilling a contract to supply T-80UD tanks to Pakistan. An external difference from earlier models is the new Ukrainian welded turret, replacing the T-80's Russian-built cast turret (some T-80s shipped to Pakistan were fitted with the T-84 welded turret, but lack other T-84 improvements). The T-84's outstanding feature is the 26 hp/t power-to-weight ratio. It has inherited the nickname Flying Tank from the T-80. The tank is also designed to perform well in hot climates, and even includes an air-conditioned crew compartment (operating temperature range is claimed to be −40 °C to 55 °C). Due to the collapse of Soviet Union, the Malyshev Factory was no longer able to obtain ceramic armour modules from Russia and only the initial batch of T-84 were produced with such. Instead, later batches of T-84's composite armour is composed of special purpose rubber sandwiched between steel and alloy plates. The exclusion of ceramic plate from the tank's armour may indicate downgraded protection compared to older models. Ukraine has demonstrated several upgraded prototypes of this tank, intended for both domestic employment and international sale.